Political turmoil in Nicaragua could pose a threat to the security of countries across Central America, the UN Security Council heard on Wednesday. The 15 ambassadors met to discuss ongoing unrest in the country, where more than 300 people have been killed and over 2,000 injured in the wake of anti-government protests that began in April. “We see crises of human rights and democracy in the Americas. We have the migratory crisis in Venezuela which should be a cautionary tale for us. Nicaragua cannot continue to have an upsurge in its political and economic life…and we can only see an increase in the migratory crisis if this continues. And this is a threat to regional security”, added the Chief of Staff to the head of the OAS. 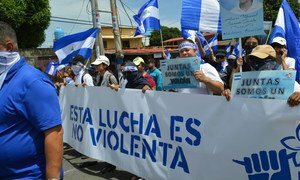 The violence and insecurity in Nicaragua has already pushed tens of thousands into Costa Rica, Honduras and other neighbouring states. Last week, the authorities expelled a UN human rights team from the country just one day after it published a report detailing alleged abuses. Felix Maradiaga, a civil society activist, spoke of the horrors he has seen or experienced at the hands of the police and paramilitary groups. He said he has received “hundreds” of death threats in addition to being shot at, beaten, and accused of fomenting terrorism. “There is not enough time for me to tell you about the pain of seeing so many young people shot down by snipers. On 30 May, in the March of the Day of Mothers, I personally saw one youth’s brains spill before me,” he told the Council. The Nicaragua meeting was convened by the United States whose Ambassador, Nikki Haley, saw parallels with the situations in Venezuela and Syria. “The Security Council should not, it cannot, be a passive observer as Nicaragua continues to decline into a failed, corrupt and dictatorial state because we know where this path leads,” she said. However, Council members were divided over what some ambassadors viewed as interference in the domestic affairs of a sovereign nation. Russian Ambassador Vassily Nebenzia was firmly in the opposition camp. Nicaragua’s Foreign Minister Denis Moncada Colindres also addressed the chamber, where he said there was “consensus” that his homeland was not a threat to international peace and security.